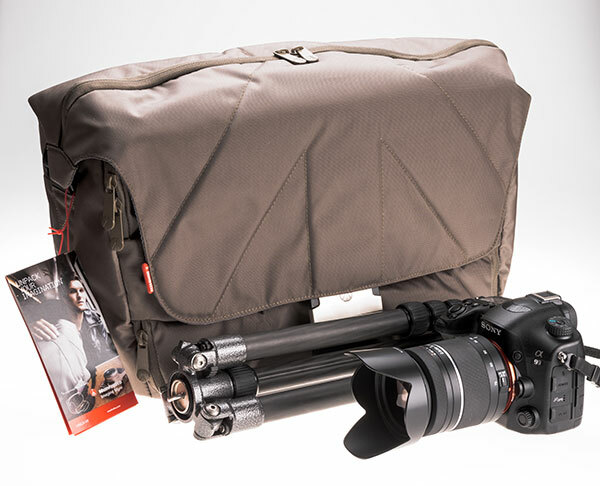 It’s a Manfrotto Stile Unica VII, the largest size made in these Chinese-fabbed courier or messenger style shoulder bags. There are a few smaller sizes but this big one can fit a MacBook Pro 15″ or a typical Windows laptop 17″ in the back of the main compartment, behind the insert. That is not unique, my ancient 1987 Tenba Messenger will also fit my MacBook and even take a couple of cameras. What it will not do it take my favourite tripod, the Gitzo Traveller 6X carbon fibre travel pod, in its base compartment. The Gitzo is designed to be shorter than the airline/airport rule on dangerous items, the same sub-14″ length as a large collapsible umbrella. This did not stop the customs guy at Bari Airport, in 2011, seizing the tripod and telling me it was not allowed and would be confiscated. I don’t speak Italian, but I do know Italians! I became very agitated and waved my arms a lot, explaining that this tripod was an Italian product, specially made for airline travel, and cost over 500 euros… and was a gift from my wife (who at this moment was clearly about to burst into tears). I could not believe that I would lose this wonderful Italian product when trying to fly back from Italy. The customs man and his female colleague turned away to confer. A second later he just handed the tripod back and motioned us through. Even so, despite its value, the Gitzo now goes in our hold baggage and not in the camera bag. It simply isn’t worth the risk of confiscation versus the risk of loss – and loss is insured, where confiscation is an untried situation with my insurance company. We have not, yet, had to ask. Once arrived, the new Stile Unica VII bag will fit the pod perfectly and it weights the bag just right. The Stile is relatively slim front to back but large, like a satchel, so it tucks under the arm in busy crowded places. 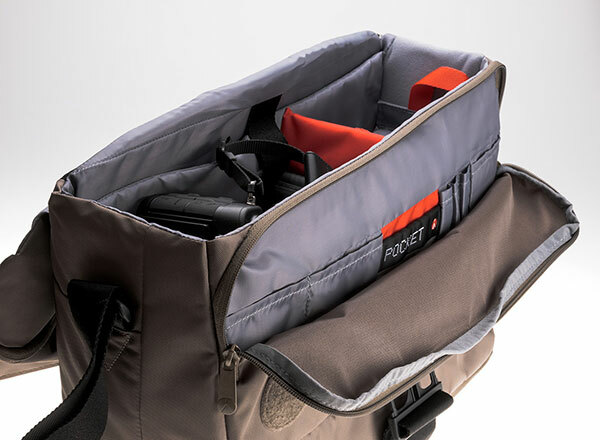 It’s easy to swing round to the front, and with the document compartment zipped up and under the flap with velcro and a huge metal webbing clip, camera access is possible through a top zip. Yes, that’s not so secure if you stand on a Barcelona street corner and swing the bag behind you. That’s where backpacks fail too. It looks slightly less like a camera bag than some, too. And you can do a padlock tie on the twin top zip and document compartment zip too. The laptop slot has a velcro tab to secure it. The camera load bay had one divider and a sort of lens-cradle thing which is not enough, but who does not have a cupboard full of spare dividers? What’s lacking is velcro fur all round to allow free layout. We use pouches or cloths to keep stuff apart. Big microfibre cleaning cloths are great, you can use them to clean the gear as well as wrap it. The actual dimensions are 16 inches clear in the base compartment, by a variable 3.5-4 inches squareish. It will not quite fit the Sony 70-400mm G lens in its pouch; this would strain the zip. It easily fits this lens ‘bare’, and the height of the top compartment is also enough for the 70-400mm standing vertically. It is a surprisingly large bag for this type of design. So, it’s not got a huge capacity or clever compartments. What is the rest of the appeal? The weight. I opened my copy of Practical Photography and found a guide to camera bags for travel. Are they nuts? All the bags I saw were really for working out of the back of your car or roller-ing along when shooting a wedding. People who fly do not start out with a bag weight over 6 kilos before loading gear. The Stile Unica VII weighs just a few grammes over 1 kilo, leaving you almost 4 kilos of payload before you hit the maximum allowed on board many smaller flights. I’ve only ever been caught once and had load up my pocket, on Croatian Airlines. In theory plenty of other carriers limit you to 5kg. BA and Easyjet allow anything you can safely lift into the overhead, some others allow 10kg. But even in 10kg, the less dead weight the bag takes up, the better. The Unica VII is even lighter than our single-layer traditional canvas photo bags, and unlike them, it has a tiny amount of padding. The next thing is the price we paid. This is an £80-90 bag officially. But at the time I post this page, you can get the unpopular mud-coloured ‘Bungee Cord’ (colour) fabric version for £32 in the UK from Amazon. That’s including VAT, not some grey import deal. This is the white version – that’s right, how impractical! 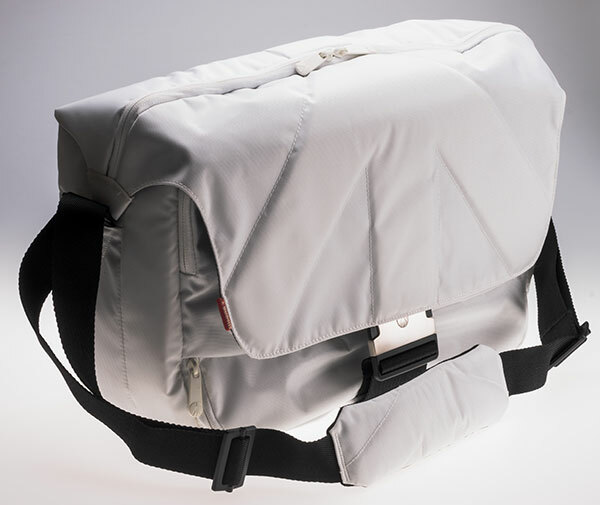 A white camera bag. Nearly as impractical as a white lens… it cost more, a touch under £50, still almost down to half price. We wanted white for travel and walking in hot, sunny conditions. Black cameras are bad enough, and can quickly rise to 40-50°C if you leave them in the sun. Dark colours, especially black, bags are poor when it comes to keeping gear cool, and it is the temperature of your DSLR which determines whether you get the best possible dynamic range and noise levels from your sensor. The Alpha 99 is a bit of an exception. These cameras are built to work with the sensor HOT, that’s what live view EVF does for you. You still get the very best performance from a cool camera and shots you take before the sensor has warmed up – and you can still get the camera do a thermal cutout on you in very hot conditions, or if you shoot long video takes. Tip: move the rear screen away from the back a bit to allow ventilation. The white Stile Unica VII is not just a fashionable dirt magnet, it is a practical camera carryall for tropical, desert and the occasional perfectly sunny day in Scotland. The muddy bungee-cord colour is less conspicuous and will take muddy marks happily. I’m not keen on the sort of half-union-jack pattern of the bag flap and I hope they never make one in red, white and blue. The fixed shoulder strap is a decent length with an adjuster on both sides and a fixed non-removable, non-sliding shoulder pad. That’s perhaps one way the price has been kept down. But the strap supplied with the Pro bag I tried was so bulky and heavy it weighed about the same as the entire Stile Unica VII and occupied most of its bag’s interior when delivered! I’m all for stuff which can be squished up, rolled, flattened and packed if need be. This bag qualifies. Here’s the Amazon link for the mud-coloured version at £32 – everyone who has bought one reckons this is a great price for a very functional if slightly depressing bag! And here are other links – the prices are £47.64 for black (as you’ll realise, I just do not recommend black at all) and £53.29 for white (eccentric but useful colour). But ‘Bungee Cord’ rules at £32! And here is a link to the Gitzo Traveller tripod (latest version) which will explain why I learned quickly to act like an Italian and get emotional – £660, over 800 euros. I think I may just put mine in a safe as buy a cheap Giottos version to actually use… and I do not need a free ‘carrying solution’ either. Another endorsement for this bag, which when packed to the hilt still gets in under Ryanair’s cabin baggage limits. Shame it doesn’t have more inserts, but a very good deal. Oh dear, clearly this is the perfect size to fill the gap not already taken by any of my other 10 camera bags so I just bought one from Amazon, can’t go wrong for £32! If anyone want’s white, Park Cameras have them in stock for £49.99 last night. Thanks for sharing your top secret tip David.